Yes...what these funny bunnies said! Thank you so much for all of your amazing comments and well wishes for Ben and I on our engagement! I am just overwhelmed and so happy to hear all of your sweet and loving words! It warms my heart more than I can say. Thank you! 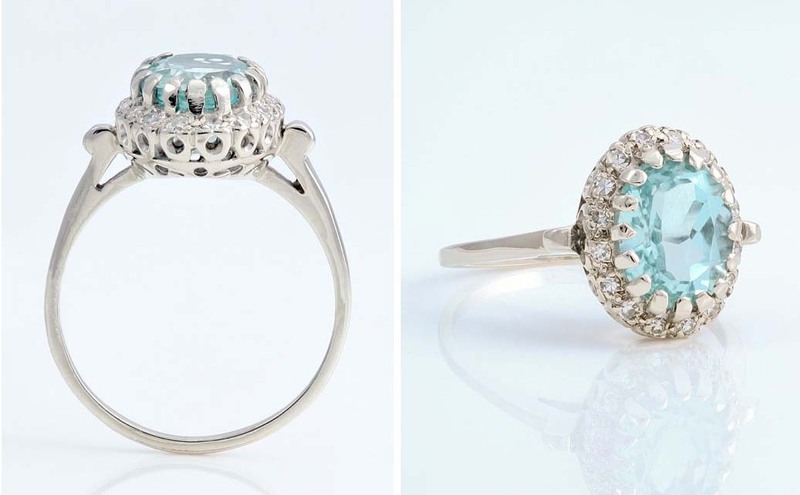 Thoughts of weddings are in the air! I've been daydreaming about my wedding day ever since Ben and I first got together (more than five years ago!) and so I've also been collecting things and ideas for our future wedding and also things that simply remind me of it! These cake toppers are a prime example. I don't anticipate actually putting any one of these toppers on our cake, but they sure look great displayed together. Where will I get the "actual" cake topper from you wonder? Well, of course I plan to make it! :) In addition to collecting toppers, I've also been hoarding a stash of antique and vintage millinery and other small doodads that I will probably use in the topper. It will be hopefully be very grand and wonderful and filled with all sorts of vintage goodies! In fact...I've been thinking about starting on it soon...that way when it gets closer to wedding time, I can concentrate on other things. What do you think? Is he better off as a bachelor? I think he's just charming by himself! This sweet 1930's bisque couple was snatched up at Brimfield from an old guy (the best kind of guy to buy from!) for a mere $2! Or was it $4? This was a little more expensive and from ebay...but I couldn't help myself. 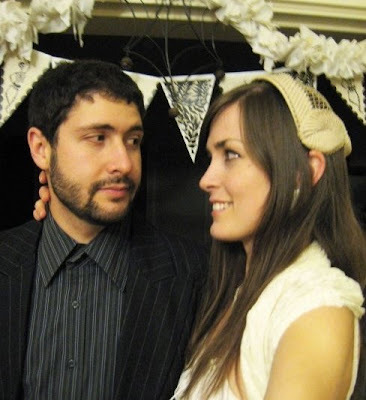 Nutcups, crepe paper, and bride and groom's hold a soft spot in my heart and these two are so adorable! I've never seen any others like them! This was the first topper I picked up several years ago at Brimfield. Not too terribly old (probably the 50's or 60's) and not in great shape...but I think they are just charming regardless! In honor of our new engagement, I've set up a little cluster of wedding goodies, including some of my handmade toppers, on top of the china cabinet. They look so cute together! Like a mass wedding! 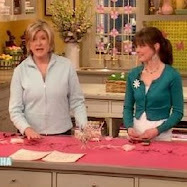 And Martha and her staff were in on it the whole time! 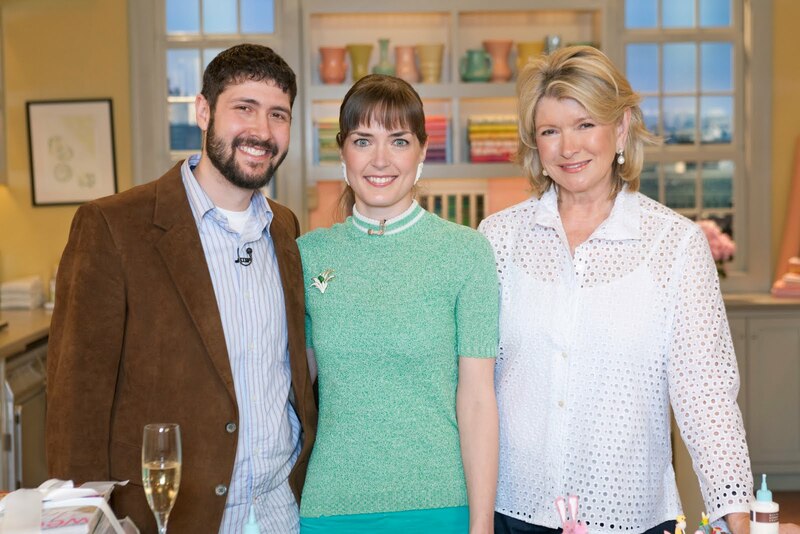 After Ben knew I was scheduled to be on the show, he snooped through my email to find the producer's contact info. After it was discussed at a meeting he got the go ahead! There was a lot of sneaking around and secret keeping on both Ben's part and the staff's part...but they did a good job because I had no idea! And our first engagement gift was from Martha (how awesome!) and she was just so pleased and happy. Thank you thank you! Ben's mom was able to join us for the show too...yay! And before we headed down to NYC, we stopped to visit my parent's for the weekend. It was Ben's idea, which was strange, but who was I to argue? He found little moments of time to be alone with each of my parents to ask them for permission. How incredibly sweet...but that's Ben for you! The whole thing was so wonderful I can't even express it! And of course I have to show off the ring! I always thought it was a little cheesy when people did that...but now I understand how they feel! This beauty is really special for many reasons other than the fact that it was a gift from Ben to me. The aquamarine stone is March's birthstone (which is the month we were engaged), it's an antique ring from France...which of course is perfect. And it looks like an Easter egg! I just adore it...especially because it was from my honey. These fantastic photos were taken by Ben's cousin Russ, who is an amazing photographer, as you can see. 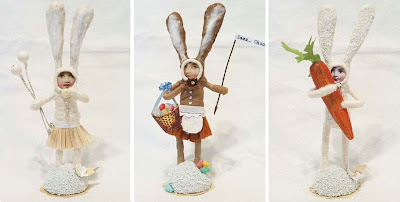 Hippity Hoppity....Easter is certainly on its way! 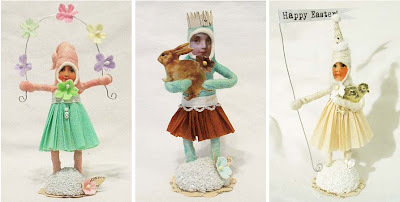 And I also realized that the Easter section of my website needed some fun new additions! Most of the characters I put on my website are for sale as open edition pieces, made to order. It was tough figuring which ones to add! To decide, I gathered up a bunch of the designs I recently completed and then decided which ones I would be able to make again (many pieces are on of kind). Then I decided which ones were my favorites, and that's how I make the cut! 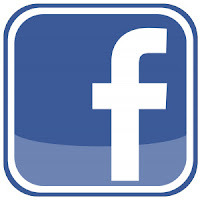 Whenever I post new items on my website, I also retire a lot of designs. Sometimes it's because I'm running out of a certain supply I need to make them (the bunny with the giant character will fall into that category sooner rather than later! ), or it might be that I decided that I'm tired of making a certain design, or sometimes it's because I decide that a certain item is too time consuming to make at its current price and I would rather retire it than raise the price. So, I'll quit blabbering on and introduce the new additions now! These Easter girls love their bunnies! This chickie girl is what I want to look like once we move to upstate NY next year, when I can finally get a flock of my very own chickens! The rose cat girl is potentially my favorite cat girl to date! 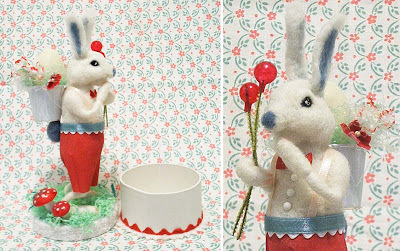 These pretty ladies are up for entertaining with their juggling skills or with their adorable Easter pets! 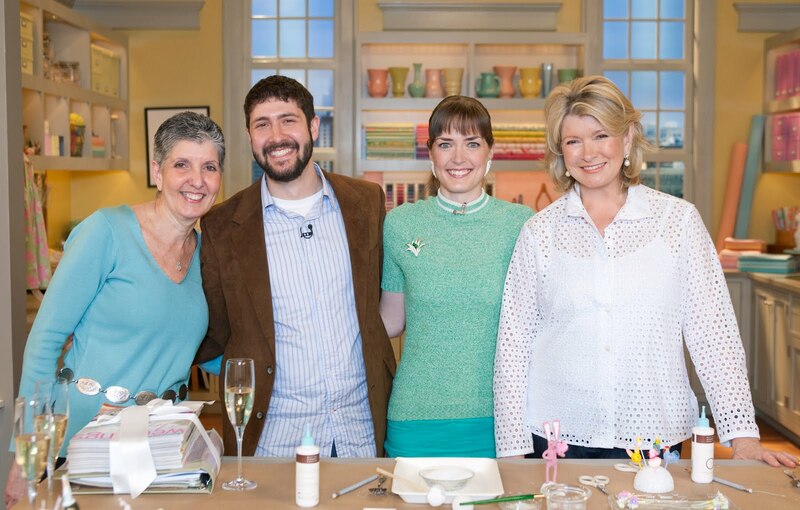 Watch me on the Martha Stewart Show next week! I'm slowly but surely working on my spun cotton Easter/Spring collection and it's just so much fun! 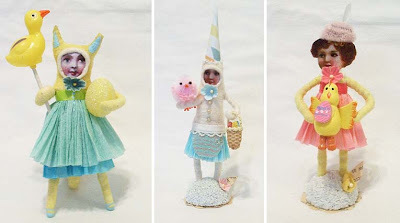 I just love all of the sugary colors and chicks and bunnies and little girls in their Easter bonnets! 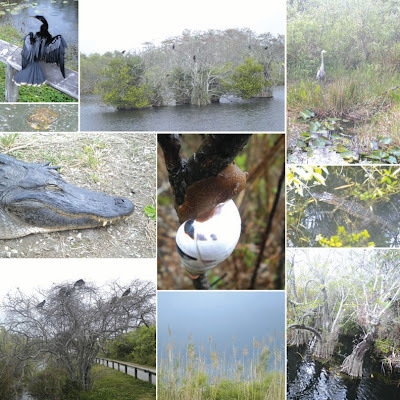 We spent one afternoon in the Everglades...a place I've always wanted to go. And it certainly didn't disappoint! I only wish we had more time to spend there. There was sooo much wildlife to see. 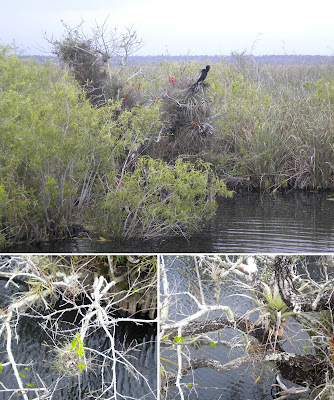 Alligators, birds, turtles, etc. A walk through the pine forest produced a gorgeous and quite large cone shaped snail that was a bit shy while he/she sat in my hand. And I drooled over the air plants! I actually bought a small collection of them about a month or so ago and to see them in the wild was amazing! They grow in huge clusters on tree branches and don't need soil to thrive, in fact they die if they are in contact with soil! The tree in the photo above is covered in giant air plants...so cool! 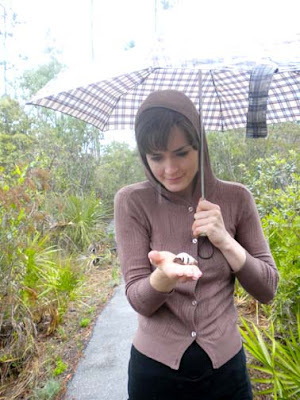 We stayed in Miami where Ben's sweet Grandma lives during the winter months. I took this photo through the windshield while we were driving after a nice afternoon in South Beach and it reminds me of the rendering illustrations I used to use in the marketing brochures I created at my old job as a graphic designer for a real estate development firm...ah memories! It was a fun trip and if you've gotten this far, thank you for looking at the photos! Pretty soon I'll show you the AMAZING treasures I picked up while browsing the antiques shops of Aventura! Say hello to our brand new Springtime Friends! 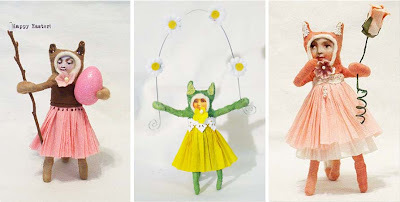 These sweet, springy characters are very special and all one of a kind - made in collaboration by both my mother and I. 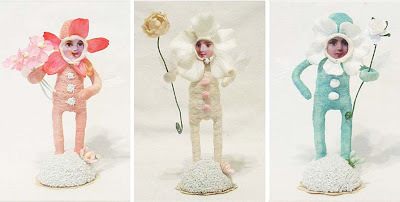 My mother (Sharon Hanehan) is an extremely talented sculpture and created the bodies of these animals using wool and the technique of needle felting. 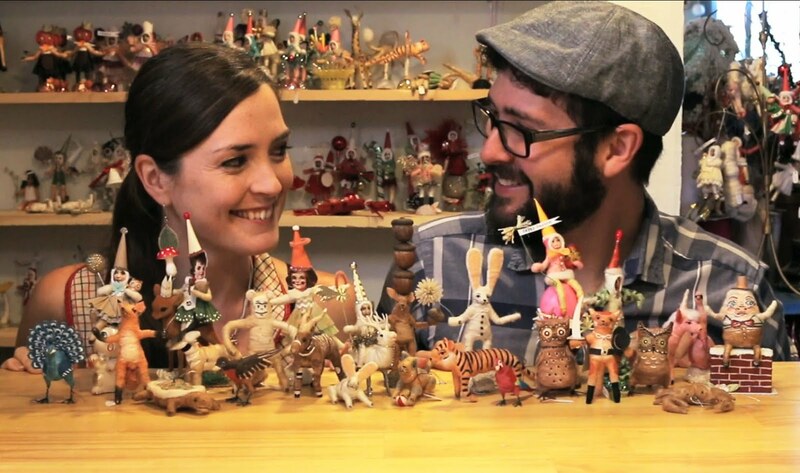 Her pieces were perfect to begin with, but we just can't have naked bunnies running around, so I dressed them up and and placed them in a fun environment, to keep them, and you entertained! My mom used all natural wool, much of which is wool from the local sheeps in and around Saratoga County NY. I used a variety of vintage and new materials to created their clothes and accessories. 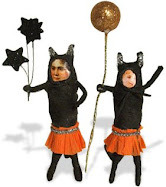 And their much larger than the spun cotton figure I normally make...they really are eye catching and make a statement! Well...enough chatting, here are more photos! 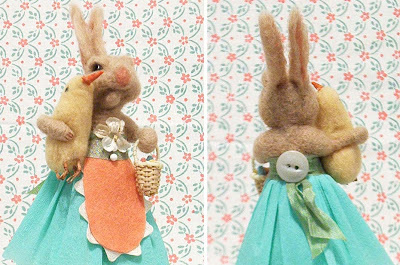 This super sweet gal has a crepe paper skirt, wool felt apron with vintage trim, and vintage lace belt, and holds a mini wicker basket holding tiny speckled eggs and a "Happy Spring" banner. 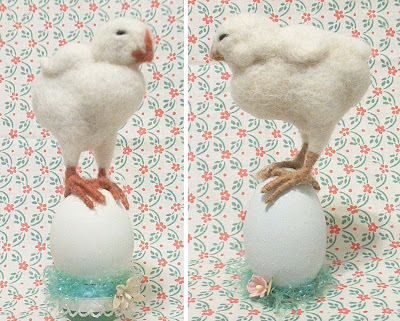 She sits on an old paper mache egg complete with vintage Easter grass and some little millinery flowers. She's the first piece that was completed and really made me excited about the rest! This fantastic bunny boy is on his way to your house to deliver some Easter goodies! He has crepe paper pants, vintage trim belt, suspenders and a bow tie. He holds vintage glass cranberries and a mini nutcup on his back filled with flowers and other treasures! He also stands on a sweet little box embellished with vintage yumminess, including vintage spun cotton mushrooms sent from Lena, my fabulous friend in Germany! This sweetie holds a vintage spun cotton chick that I've been holding onto for quite sometime. She is perfect with it, so I decided she deserved to hold on to it now. She wears a brightly colored teal and green crepe paper dress with wool felt apron and has all the vintage trimmings. She stands on a hexagonal box dotted with tiny Easter eggs, yet to be discovered and dropped into her basket. This brown beauty wears a crepe paper dress with full felt apron hand painted and trimmed with vintage lace. 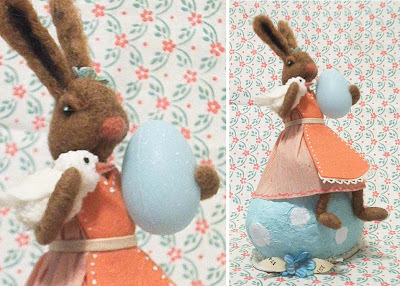 She sits on an oversized paper mache egg spotted Easter egg and holds tight to her smaller, but still large blue egg and pom pom birdie. I just love the color combo here...so pretty! What a jolly group they make! These fantastic chick sculptures were made by mom of course. 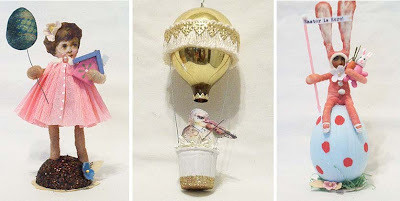 They are a bit larger than life and make a wonderful Easter statement in any springtime display. These two chickies whispered in my ear and said they wanted a little something extra, so I put them onto nice white eggs nestled in some vintage Easter grass. Can you tell which egg is real and which is wooden? This upright duckling is looking for his new mom! Aren't his little webbed feet to die for? ...are the babies inside! 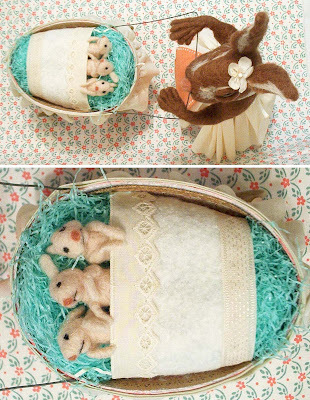 These cuties are nestled in vintage Easter grass and warmed under a cotton batting blanket edged in old lace and trim. And they aren't glued in...take the blanket off and you can pick up the sweet babes and see how beautifully detailed they are! 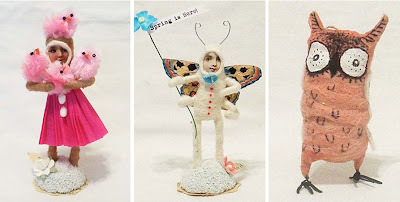 Thank you Mom for working together on this amazing springtime collection! It was so much fun working with her amazing sculptures and digging into parts of my vintage materials stash that I don't normally touch! These 1980's My Little Ponies are a gift for a friend who fixes them up. As long as the pictures on their booties aren't scratched or worn off...they're good for a makeover! I've been refraining from purchasing plates (My cabinet is officially full! ), but I'd like to replace Ben's ugly bowl set...these pretty pinecones are an excellent start! Ben also found a mini cutting board for a quarter, which we'll be using quite often in the kitchen - perfect for cutting a single tomato or onion. 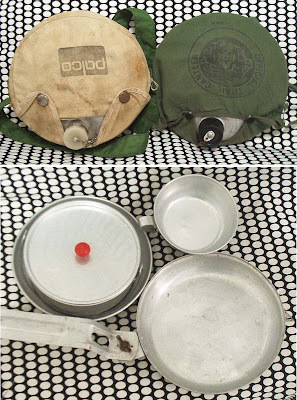 Ben spotted these excellent vintage canteens and a camping cookware set. I love these! They are so great for camping, which we plan on doing a bunch of this summer! But I think Ben has his mind on selling them...maybe I'll buy them! These pillows are very mini and adorable! They match our living room perfectly! But I think these are going on Etsy too. Gosh...maybe I shouldn't have brought Ben treasure hunting with me! 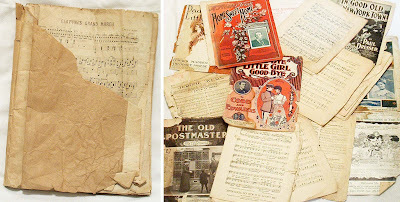 The very best kind of real antique sheet music. Most of this will be in the shop, but not before I grab a bunch for myself! 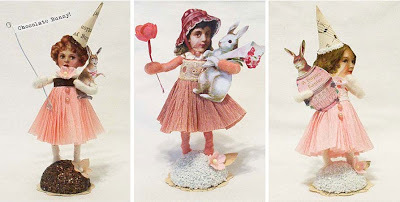 These old yarn art cards are fantastic! 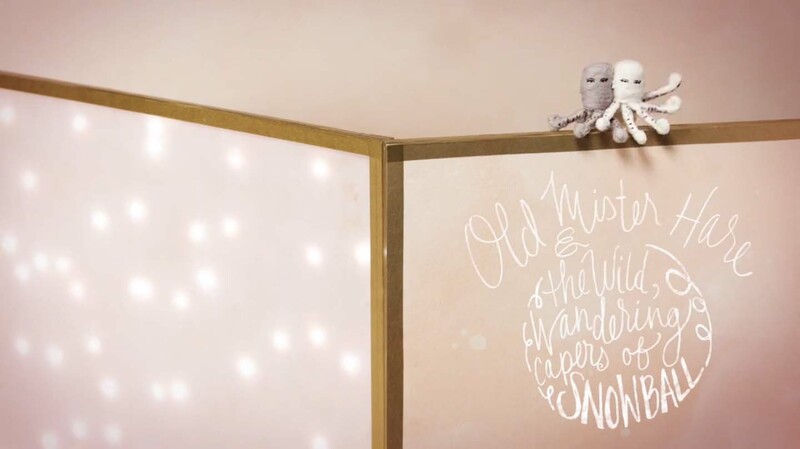 They'll look great in a frame or can keep the kids (like Ben) entertained for hours! This paint-by-number great dane was my favorite find of the day. A shaky hand executed it, but it only adds to the charm! I'm not letting Ben get his hands on this one! 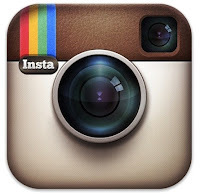 On another note...I've got some exciting things to post tomorrow! Stay tuned!